Teaching the teacher! How fun to have Ari’s 6th grade teacher, Karen Johnson, join us today after not seeing her for 10 years! 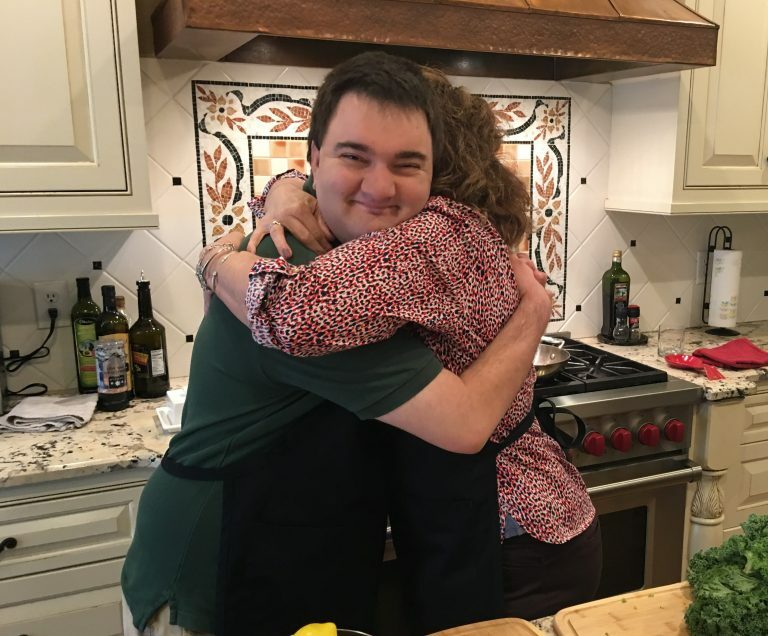 What a nice surprise to learn that she loves to cook with kids! We shared our Mediterranean Salmon recipe with her. 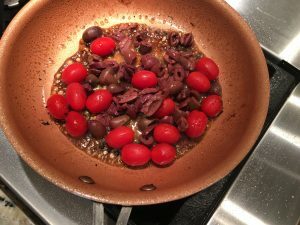 Easy and delicious, this recipe with fresh garlic, lemon juice, oregano, sweet grape tomatoes and salty Kalamata olives brings back memories of Greece. There is nothing like an excellent teacher and Karen is one of the special ones. She said her students called her a Strict Warm Fuzzy because she would say “I love you, now let’s get back to work!”. I know that she had a huge impact on my son’s life and many, many other children’s as well. We loved re-connecting with her this afternoon. 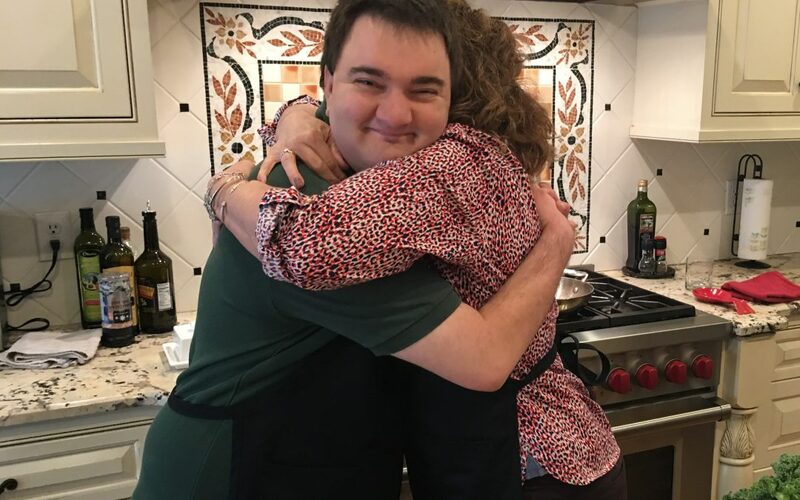 We not only got to cook together, but it gave us an opportunity to thank her again for all that she does. The teachers are the real heroes in this world! Teaching our kids everyday, shaping them into responsible, and educated little people is such an important job. Thank you to all the teachers for all that you do! We don’t say it often enough. We appreciated that Karen tried our warm kale salad even though she said she’s not a huge fan of kale. It seems that you either like kale or you don’t, but you have to try foods again and again, because tastes do change. Depending how it’s made makes a difference. I’m not sure we totally won her over to the “we like kale” team, but she bravely gave ours a try. 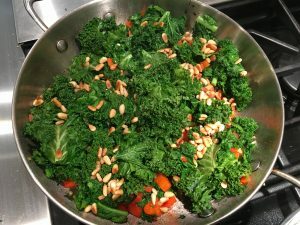 Here’s a tip: If you aren’t a big fan of kale, it helps to shred the kale into much smaller pieces, that way the texture is not an issue and it blends in with the other ingredients. I have also made this kale salad with sautéed mushrooms, onions, and Kalamata olives in addition to the red bell pepper and pine nuts and it is even more delicious! You can easily add whatever sounds good to you and make it your own. Click here for the recipe. Mix marinade ingredients - olive oil, lemon juice, oregano, garlic, salt and pepper together in a rimmed dish. Stir to combine. When 30 minutes is up, heat 2 tbs of butter and 2 tbs of olive oil in a non-stick frying pan over medium-high heat. 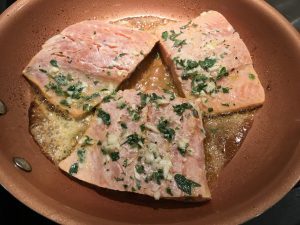 When sizzling, add salmon fillets face up (if they have skin). Cook for 3-4 minutes a side depending on thickness. (1" for 3 min, 1 1/2" for 4 min). Remove salmon to a plate. Cover with foil and keep warm. Add a tbs of olive oil to the pan. When hot, add the grape tomatoes and chopped Kalamata olives. Sauté over medium-high heat, stirring occasionally to rotate tomatoes. They are done when the grape tomatoes are slightly shriveled on all sides. 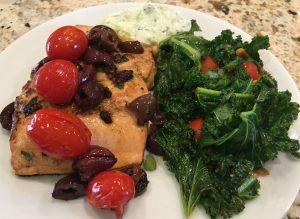 Serve each salmon fillet topped with tomatoes and olives, a side of warm Kale Salad, and tzatziki sauce.